Not this type of Bond. Two of the most seasoned borrowers on North America’s capital markets, the Province of Ontario and Export Development Canada, took the unusual step recently of seeking advice from a group of climate-change researchers in faraway Norway. CICERO’s work underscores one of the biggest challenges facing the green bond market as it makes the transition from a pet project of environmental activists into the mainstream of global finance. Which projects deserve to be classified as green? Who is best qualified to be the judge? Should there be a single set of international standards for green bonds? Should such standards be voluntary or mandatory? The answers to such questions will determine the future credibility of the green bond movement. Demand for green bond issues has ballooned in the past two years as pension funds and other pools of capital – joined increasingly by retail investors – have sought to burnish their social-responsibility credentials. “Green bonds are building an investor base that’s more aware of what the money they’re investing is achieving in terms of impact and outcomes,” says Heike Reichelt, head of investor relations and new products at the World Bank, which has raised over $7 billion (U.S.) from 77 green bond issues in 17 currencies since the market’s inception in 2007. 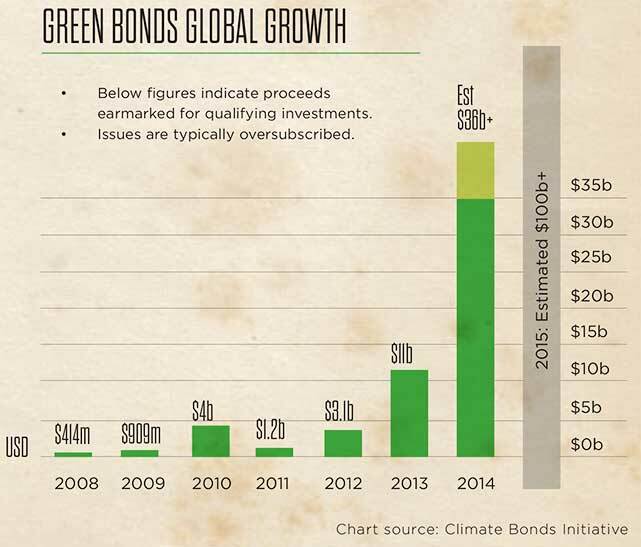 Investors bought less than $5 billion of green bonds a year between 2007 and 2012. But demand soared to $11 billion in 2013, and to more than $35 billion last year. The market took an important step forward in January 2014 when 13 of the world’s biggest banks agreed on a set of voluntary Green Bond Principles that set out a process for designating, disclosing, managing and reporting on green bond issues. The original signatories included Bank of America, Citigroup, Crédit Agricole, Deutsche Bank, Goldman Sachs and HSBC. Several others, including Royal Bank of Canada, have subsequently signed on. The market has gained sufficient traction that U.K.-based Barclays and MSCI, a compiler of capital markets data, launched a green bond index in mid-November. A bond’s eligibility for inclusion in the index is judged according to four criteria: use of proceeds, project evaluation, management of proceeds, and reporting. Green bonds “have got a lot of momentum, but they’re still such a marginal portion of the bond market,” says Christa Clapp, CICERO’s head of climate finance. Clapp estimates that green bond issuance still makes up just 0.04 per cent of a total that amounts to about $80 trillion a year. “There’s just not a big awareness of it yet,” she says. The time and effort involved in educating investors means that issuing a green bond requires more preparatory work – at least for the time being – than a regular public borrowing. “The marketing process is maybe a little more involved than when we do a benchmark, plain-vanilla type issue,” says Michael Manning, executive director for capital markets at the Ontario Financing Authority, which launched the province’s maiden $500 million (Canadian) green bond last October. Susan Love, EDC’s treasurer, says the Ottawa-based export-finance agency spent two years laying the groundwork for its first green bond, a $300 million (U.S.) issue. Negotiations on the pricing of the Ontario bond took six days, compared with as little as 10 minutes for a regular domestic deal. But patience has paid off. Sixteen of 27 investors that subscribed to EDC’s issue last January had no previous dealings with the corporation. Similarly, Ontario’s green bond drew five new investors. On a less sentimental level, green bonds provide a rebuttal to the argument often heard around boardroom tables that protecting the environment runs counter to maximizing corporate profits. Interest payments on a green bond are generally no more – and sometimes even less – than a conventional public borrowing. Conversely, for investors, “green bonds could be a good way to be responsible without taking a bigger risk,” says Olaf Weber, associate professor and chair of the sustainability management program at the University of Waterloo. The recent Ontario bond, which is being used to help finance Toronto’s newest light-rail transit line, was more than four times over-subscribed. In a sign of investors’ enthusiasm, the bond was trading 35 basis points (0.35 of a percentage point) above the benchmark Government of Canada issue in mid-November, three basis points tighter than a similar conventional Ontario bond. Kidney predicts that green bond issuance could more than double this year, and that a total of $300 billion in financings is “eminently achievable” by 2018. He cites several promising areas for growth – among them, private-sector companies, China, and the municipal bond market. Corporate issuers have been a driving force in the explosion of green bond issuance over the past 18 months. Borrowers have included companies as diverse as Toyota, Unilever, and Stockland, Australia’s biggest real-estate trust. Reichelt at the World Bank says many corporations are genuinely changing how they operate and are starting to incorporate these types of aspects into their business. “Green bonds are a good way to communicate that,” he says. Then there’s China. Kidney sees the Chinese green bond market exploding over the next 12 months as Beijing steps up its anti-pollution drive and investment in renewable energy. Ma Jun, chief economist at the People’s Bank of China, has pointed to green bonds as one of the financial instruments that China needs to put in place to support government policies. “They should have lower financing costs and greater support from the government, such as tax exemptions,” Jun reportedly said last spring. Municipalities are also an obvious target for the green bond movement. Not only are they among the biggest borrowers on global capital markets, but much of the money they raise is spent on infrastructure well suited to closer environmental scrutiny. The Swedish city of Gothenburg has issued two green bonds to finance public transport, water management, energy, and waste management projects. Other municipal issuers of green city bonds include Paris, New York and Johannesburg. At the national level, there has even been talk of “green quantitative easing,” through which central banks would inject money into the economy by purchasing only green infrastructure bonds. The idea is to both stimulate economic activity and boost the availability of capital for climate mitigation and adaptation projects. There’s also the issue of so-called additionality. In other words, if a green bond isn’t attracting new – additional – investment to low-carbon projects, is it anything more than just an exercise in greenwashing? The same question has long plagued the credibility and growth of the market for carbon offsets. 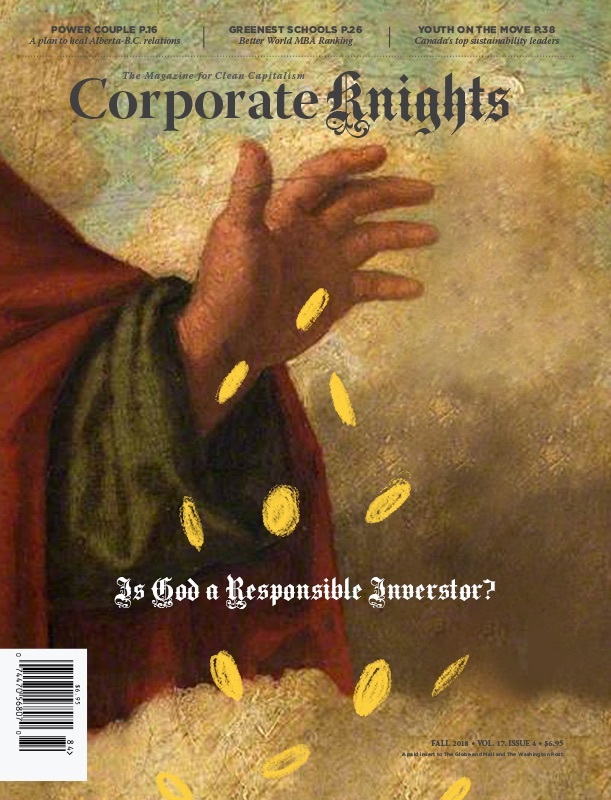 Meanwhile, a vigorous debate has erupted in the green bond community – researchers, bankers, issuers, investors and environmental activists, among others – over what criteria should determine whether a project is eligible to be financed by a green bond, and who should decide whether those criteria have been met. Some take a more middle-of-the-road approach. The World Bank, one of the first and still one of the biggest issuers of green bonds, has developed its own criteria for eligible projects. In doing so, it sought advice from investors and a second opinion from CICERO. “This was the investors telling us, ‘These are the types of projects you finance that we want to support’,” Reichelt says. CICERO also favours a balanced approach. “The most important thing is that investors have disclosure,” Clapp says. “That’s done through a second opinion or through a standard. I just don’t see that one standard fits all – not right now”. The Norwegians have so far issued second opinions on about 30 bond issues – including the recent EDC and Ontario bonds. They broadened their base last June by joining forces with four other research groups to set up an Expert Network on Second Opinions, known as ENSO. The new partners include the International Institute for Sustainable Development, based in Winnipeg; the others are in Spain, China and Sweden. CICERO is working on a green-bond grading system that Clapp describes as a “menu of choices,” ranging from dark green for projects that are most effective in combating climate change, to lighter shades for those that make a more modest contribution but need to take other realities into account.